There are many ways that you can get involved with the health and success of the urban forest around you. Sign-up to receive a tree coupon to use towards the purchase of up to five trees at participating nurseries. Plant free trees in your right-of-way by participating in Grit City Trees Program. Work with your neighbors and the City of Tacoma will deliver the free trees to designated nearby spot in your neighborhood. Share the love and help speak for the trees. Your neighbors, co-workers, friends and family deserve to know about the benefits of trees, how to properly select, plant, prune, maintain their trees to enjoy them for a lifetime (or more), and how to get involved. Volunteer through the Green Tacoma Partnership. Volunteers are needed not only to get their hands dirty while removing invasive species and planting, but also for educational and outreach opportunities as well. Strengthen our Tree City USA and help us celebrate our recognition or get some ideas for new projects in your neighborhood. Get to know the trees that are part of your community. Take notes about what you see and learn about the different species and which trees are best for our area. You can learn about many of the trees by reviewing our Recommended Street Tree Lists. Take the Tree Board University online courses for free! This is a great resource for any tree advocate no matter how long you have been working on these issues. Learn about how trees and parks pay you back. By investing in trees urban environments can save millions of dollars in stormwater mitigation, urban cooling, and air pollution reduction. Trees also increase our quality of life and beautify our City giving it "sense of place". These attributes improve our overall tourism and increase activity in business districts. 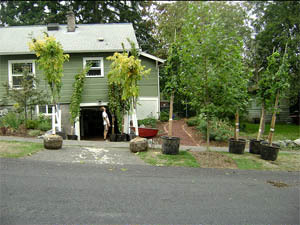 Learn more about natural yard care, pruning, rain gardens, tree planting, tree basics and more! Sign up with EnviroHouse. Call 3-1-1 for immediate concerns about the health of trees in the rights-of-way. You can also become a citizen scientist and help identify invasive insects that could damage our trees. iMapInvasives is one option for getting involved. Perhaps you're considering changing careers or just starting your education. The arboriculture and related fields present lots of opportunities to get involved and make a difference. Arboriculture, Forestry, Urban Forestry, Horticulture, Landscape Architecture, Construction and Install, and Planning fields (to name a few), all have impacts on the health and beauty of our communities. Arboriculture alone includes several types of jobs from utility arboriculture to municipal and consulting. Lots of unique job opportunities await! A few resources for exploring tree-related fields are included below for ideas. Sign up for free tree selection, planting, pruning and other gardening workshops through EnviroHouse.